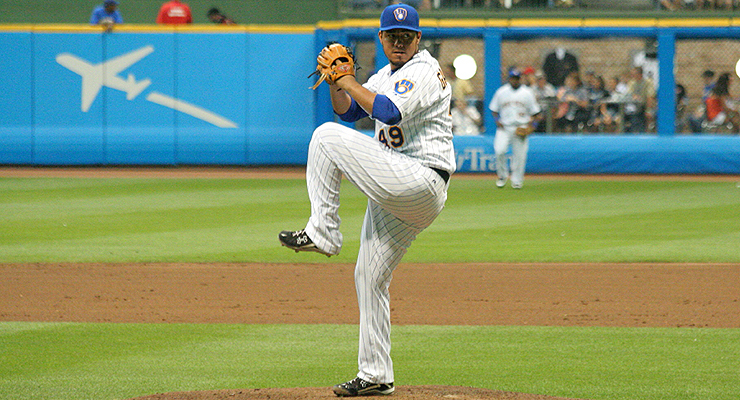 It’s rare that a second-round pick becomes as productive as Yovani Gallardo (via Steven Paluch). Yesterday, we tackled the total value of each draft pick, and how that has changed since the last studies on the subject. Today, we’re going to get into the net value that each draft pick produces, and how that affected the last free-agent class. How Much Net Value Does Each Draft Pick Produce? To determine a pick’s net value, we need to know how much that player will cost, and how much that same production would cost on the free agent market. There are a lot of moving parts here, such as the ever-increasing cost of a win and salary changes for pre-arbitration players, so we’ll keep things as simple as possible. Signing bonus: For our purposes, we will assume that each draft pick receives the full assigned value for his pick. Pre-arbitration salary: The major-league minimum salary is currently $480,000, so we’ll assume that each player will make $1.5 million before he becomes eligible for arbitration. However, since the 25-man roster spot occupied by the draft pick will cost at least the major-league minimum, even for a replacement player who provides no real value, this money will not be included in a player’s cost. Arbitration salary: How much a player makes in his arbitration-eligible years. Minor leagues: Minor leaguers barely make any money, and the player development infrastructure is already in place, so we’ll ignore any cost here. The first two are pretty straightforward, so all that’s left is to calculate the average arbitration salaries for each pick. While arbitration salaries can be projected quite accurately when you have a player’s numbers, we’re trying to make more general projections for draft picks. One strategy would be to project a player’s salary by determining the relationship between arbitration salaries and the free-agent market. For example, if we know that a first-time arbitration-eligible player generally makes 35 percent of his market value, and know the average production for each draft pick and the cost of a win on the free-agent market, we can project his salary. Nate Silver looked into this in 2005. His research was based on findings that arbitration-eligible players earned an average of 44 percent, 61 percent and 64 percent of their market value. It’s not surprising that relievers get paid the most relative to the WAR they produce, but we also know that relievers make more money in free agency than we would expect based on WAR alone. Because we’re not assuming a given position for the player drafted, we’re really interested in the total for all players. And the last few years have shown that players are making less money relative to their free-market value than they were a decade ago. While this type of analysis is useful, it’s important to keep in mind that players are paid based on their past, and not expected, performance. If we look at 84 players who recently went through the arbitration process at least twice, we see a significant correlation between the first arbitration salary and total pre-arbitration WAR (r = 0.76). Meanwhile, the correlation to WAR produced in that same season was not reflective of the player’s salary (r = 0.39). Salary the second and third time through is based partly on performance in the most recent year, but the biggest factor is the previous year’s salary (r = .84 for years 1:2, and r = .89 for years 2:3). We can use these numbers and perform a series of simple linear regressions to model arbitration salaries based entirely on WAR. By using the average value of a win over the time period of this sample (about $7 million), we can translate this number back into net value by WAR. While not everyone is compensated the same, this model works well enough to project average salaries for groups of players, which is the goal. I decided to use arbitration costs exclusively (and not long-term extensions signed before free-agency) for two reasons. The first is that most players who are drafted don’t sign long-term extensions. When a team drafts a player, It is guaranteed his rights for only his first six-plus years in the majors. The second reason is simplicity. If extensions were included, they would need to be accounted for on a case-by-case basis. This would be manageable for a few draft classes, but when you increase the scope to 15 seasons the amount of manual work becomes prohibitive. As this model accounts for only arbitration costs, it may slightly undervalue draft picks because it does not factor in the leverage that the team has in negotiating discounted long-term deals. Let’s step back and see what we have so far. Based on historical data, we can project average WAR per draft pick and the average cost of that player under his years of team control. And since recently, players haven’t experience a true peak but rather play evenly until they begin to decline, I assumed that WAR would be evenly distributed across all six team-controlled seasons. We can use this information to project a net value for each draft pick. Before we bring the question of time into the picture, let’s chart the average expected value of the first 30 picks, using both methods of projecting arbitration salary (percentage of market for the method based on Nate Silver’s research, WAR for the WAR-based arbitration model discussed above). *The dollar cost listed is the total amount of money the player will earn above the major-league minimum; see above for explanation. For the first five picks, the market percentage model actually projects a lower net value than the WAR model, although this quickly reverses itself and the differences become amplified, approaching a $3 million difference near the end of the first round. So which model does a better job at predicting actual arbitration costs? As you can see, the WAR model has the upper hand for this type of player, especially when the player has a breakout season in his final year of arbitration (as Gomez and Saltalamacchia recently did). For all players who have gone through three rounds of arbitration in the past five years, the WAR model has a higher correlation to actual salaries than the market percentage model — R2 values of 0.70 and 0.53, respectively (an average of Steamer and ZiPS projections was used to estimate WAR for players entering their final year of arbitration in 2014). At the other end of the spectrum, we don’t find quite as many examples. Let’s look at the 55th pick, which will produce an average of 2.05 WAR. The market percentage model projects $3 million in arbitration, for a net value of $11.8 million, while the WAR model projects $6.2 million in arbitration for a net value of $8.6 million. Recent players who totaled around 2.05 WAR under team control have mostly been relievers, such as Boone Logan (2.0 WAR) and Joe Smith (2.2 WAR), who received $5.8 million and $6.2 million in arbitration respectively. While the WAR-based arbitration does a better job of projecting actual arbitration salaries, the lack of players in this range shows its limitations. When we calculate net value from a model like this, we’re treating a second-round draft pick as though it always turns into Boone Logan. In fact, 85-90 percent of the time it turns into nothing, but the rest of the time you get a player like Seth Smith (50th pick in 2004), Yovani Gallardo (46th pick in 2004) or even the occasional Joey Votto (44th pick in 2002). Players who are roughly league-average or better (at least 1.5 WAR/season) make roughly 30 percent of their market value during arbitration. On the other hand, the borderline major leaguers – think Jerome Williams, Garrett Jones or Daniel Descalso – get paid closer to 60 percent of their market value (even when removing relievers from the group). In other words, because there is a salary floor, this model will have some issues when calculating the value of later draft picks, since less valuable players get paid more relative their market value than players who are league-average or better. The good news is that we can adjust this model by including only players who clearly belong in the major leagues. 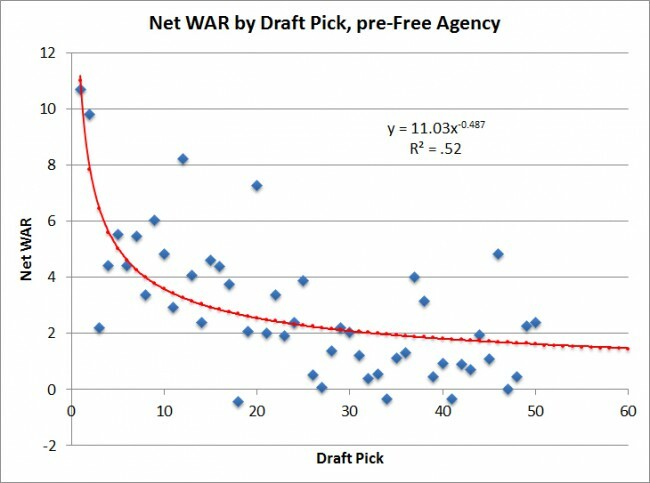 For example, only 15 percent of players drafted in picks 41-50 will actually total three or more WAR before they hit free agency, and those players produce an average of 12.6 WAR. Instead of looking at these picks as averaging a 2.2 WAR player, we need to imagine it as a lottery ticket giving the team a 15 percent chance of getting a 12.6 WAR player and roughly $74 million of net value. For reference, these are the odds that a given draft pick will stick around in the majors (three-plus WAR under team control) or become something resembling a league-average player, or better (10+ WAR). What we did above was use the historical data to project average WAR, and then calculate net value using this projection. Alternatively, since the WAR-based arbitration model is better suited for individual players instead of groups, we can apply it to each individual draft pick from our 1991-2005 data set. This graph looks quite a bit like the one shown earlier depicting total WAR under team control. The main difference is the coefficient (11.0 versus 14.1), which tells you that for the earlier picks, about 78 percent of a drafted player’s total WAR under team control is net value for the team. Put another way, when a draftee turns into a major league player (at least 0.5 WAR/year), he will earn roughly 22 percent of his market value before hitting free agency (on top of the major-league minimum). These numbers are actually fairly close to those that we calculated using percent of market value, once you adjust for the inclusion of the major league minimum earlier. If these numbers seem a bit high, they should, because there’s still one more thing we need to adjust for. When it comes to money, now is always better. Matt Swartz did a great job of explaining how baseball transactions are investments. Money buys players, players earn wins, and win puts fans in the seats with team jerseys on their backs, bringing money back to the owners. The circle of life. With this in mind, it’s not a surprise that teams place a discounted value on future wins. Sure, there may be some exceptions. Teams like the Astros and Cubs would almost certainly borrow a few wins from 2014 if they were allowed to count toward future seasons. However, across the majority of baseball, sooner is better. Nate Silver estimated a five percent discount on value for future seasons and Matt Swartz has estimated it to be 10 percent annually, a figure I will use here. One way to account for this is to simply discount the total value in one shot. The average player reaches the majors around three years after being drafted, so his team-control years in which he produces value are three to nine after the draft. If you apply the discount to the average of six years after the draft, you can simply subtract 47 percent (0.9^6 = 0.53) from the average value. However, there’s another factor to consider, which is where the value is coming. A disproportionate amount of a player’s net value is accrued in the first three years under team control when salary is at its lowest. This is also where the future discount should apply the least. Not only do we not see a big difference, but the year-by-year calculation actually further devalues the draft picks. The reason is that there is a significant increase in net WAR over the first few years of team control. However, this benefit is more than offset by the fact that one of the biggest payments from the team’s side – the signing bonus – is paid up front. Regardless of how you apply the discount, this table illustrates how much this affects a draft pick’s value. For example, a pick in the 26-30 range (like the one the Braves gave up for Ervin Santana) appears to be worth around $16.6 million in today’s dollars. However, when you account for the fact that the pick won’t produce any value for years to come, the value drops more than 50 percent to $8.1 million. The same draft picks would be worth $10.9 million if you were to assume just a five percent annual discount for future WAR (as Silver did). I’m not an economist, so I’ll yield to Matt Swartz who is much more qualified to measure the future value of major league wins, as he has in the past. This point merely illustrates how a team building for a few years down the road that might not discount future WAR quite as much can end up with a very different draft pick valuation. WAR figures for draft picks from 1991-2005 are from Baseball-Reference’s draft tool. WAR figures for recent arbitration-eligible players are from FanGraphs. Arbitration salaries are from Baseball-Reference and Cot’s Baseball Contracts. Matt is a PhD student researching cancer and stem cell biology, and spends some of his free time writing about the analytics of beer at BeerGraphs and contributing to The Hardball Times. Follow him on twitter at @murphym45. Good work. One thing to consider with Santana and the Braves is that he was signed early enough that they can put another QO on him after the season. Not 100% – injury or a slump could make that an unappealing option, but they stand a decent chance of getting a draft pick back. This is true (and was actually raised in the comments section of the first article as well). While it doesn’t change the actual value of the draft pick that the Braves gave up (or might receive), it should certainly be factored into how we evaluate the signing. Out of curiosity, how did you handle the no-signs? Did you average in the zeros or remove them from the data set entirely? Thanks a lot, glad you enjoyed the article! Interesting that Dan Szymborski said that he only discounts 4% annually, it feels like this is the area where the biggest discrepancy in draft pick values exists (and is the most difficult to accurately determine). It could have something to do with the fact that the GM isn’t guaranteed to still be around by the time a good draft pick eventually pays off.